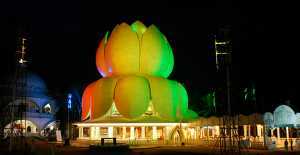 Trivandrum, 22 February 2012: The newly installed LED lighting system of the Lotus Parnasala at Santhigiri Ashram on February 22nd will be inaugurated by Kerala CM Oommen Chandy today. Today which marks the day of Poojithapeedam Samarpana Celebration and the biannual Kumbhamela will begin with a Pushpanjali at 5am and the flag hoisting at 6 am. It will be followed by Floral Offering at Parnasala, Guru Darshanam and other offerings before the Guru. The Poojitha Peedam samarpanam Meeting will be inaugurated be Kerala Finance Minister K.M. Mani and Social Welfare Minister Dr. M.K. Muneer will preside. The Kumbhamela procession, which will begin by 4 pm, will go round the Spiritual Zone before the kumbhams and deepams will be submitted before Guru at the Lotus Parnasala. Thousands of devotees and well-wishers from all walks of life will congregate at the Ashram for the occasion. The Biannual Kumbhamela is celebrated on the day on Poojithapeedam Samarpanam Celabration, the day which marks spiritual ascension of the Abhivandya Shishyapoojitha Amritha JnanaThapaswini into the highest plane of spiritual evolution. In 2001, the Shishyapoojitha endured 41 days of severe physical and spiritual ordeals. Every year, these 41 days are observed by the devotees in great austerities and prayers. The newly installed LED Lighting System of Lotus Parnasala will be inaugurated by Chief Minister OOmmen Chandy in a meeting scheduled to begin by 7 pm in the evening. The Union Minister for State for Civil Supplies Prof. K.V. Thomas will preside. State Rural Development Minister K.C. Joseph, Tourism Minister A.P. Anil Kumar, Minister for Transport V.S. Sivakumar, Excise Minister K. Babu, Agriculture Minister K.P.Mohanan, Members of Parliament A. Sampath, N. Peethambara Kurup, Mayor Adv. K. Chandrika, MLAs, and other dignitaries will also be present. The LED lighting system will be switched on with the accompaniment of a fusion music performance by a 40 member team led by Violinist Balabhasker. The worderful light-sound-music show has been directed by renowned film director and sculptor Rajeev Anchal. The idea of illumination was proposed by eminent cinematographer S. Kumar, and the lighting concepts handled by 3S International, Canada.